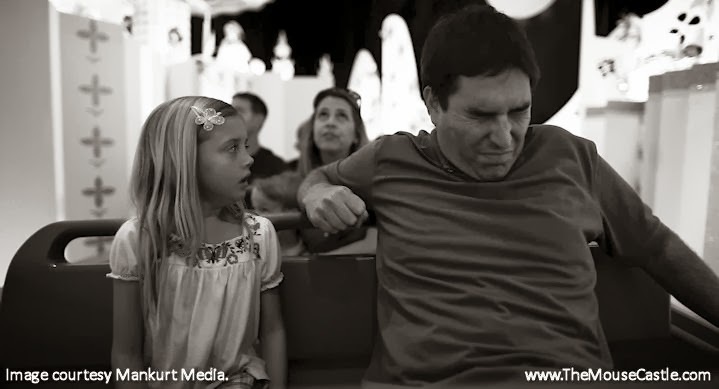 Escape From Tomorrow is the new independent film Disney doesn't want you to see. Shot on Disney theme park property without Disney's knowledge or consent, the film paints a dark, surreal picture of life behind the pixie dust. It's created quite a stir since its debut at the Sundance Film Festival in January and today it goes into limited release in theaters nationwide. It will also be available in video-on-demand on iTunes and Amazon. Sara (Katelynn Rodriguez) watches her dad (Roy Abramsohn) freak out on It's a Small World in Escape From Tomorrow. In The Mouse Castle Lounge, I talk with Escape From Tomorrow's director Randy Moore about how he secretly made a feature length film at Disneyland and Walt Disney World and what he feels the message of his movie is. Joining Moore are his two stars, Roy Abramsohn and Elena Schuber, who talk about their roles and what it was like to make a film with Disney as the backdrop. I also share my review of the film. Is it a daring piece of guerrilla film making, or is pulling one over on Disney the only thing it has going for it? Find out in today's edition of The Mouse Castle Lounge. Enjoy!